The 2019 Oscars nominations are here and, as it turns out, it was a big year for blockbuster movies. To that point, Avengers: Infinity War, Solo: A Star Wars Story and A Quiet Place all scored nominations in technical categories. While none of these movies are up for the night's top prize, it still represents the Academy showing some love for some of last year's biggest movies and, perhaps more importantly (more on that in a minute), some of the most popular movies from 2018. Starting with Avengers: Infinity War, Joe and Anthony Russo's record-breaking event movie scored an Oscar nomination for Best Visual Effects. This isn't just a token nomination to honor a blockbuster breakout, either. Thanos is one of the most impressively realized CGI character creations ever put to screen and top to bottom, Marvel knows what they're doing when it comes to making a visually impressive crowd-pleaser. Ron Howard's Solo: A Star Wars Story also scored its nomination in the same category. Again, this is a Star Wars movie we're talking about. While the franchise is known for a lot, it's groundbreaking visuals are right near the top of the list. Say what you will about the movie, but it's visual effects are top notch. The competition in this category includes Ready Player One, Christopher Robin and First Man. As for A Quiet Place, the breakout hit horror thriller from director John Krasinski, it earned a nomination, quite fittingly, in Best Sound Editing category. Anyone who has seen the movie knows that it plays very creatively with sound in order to deliver an unforgettable experience for the audience. Oddly, the movie wasn't also nominated for Best Sound Mixing. More often than not, movies tend to be nominated for both awards. 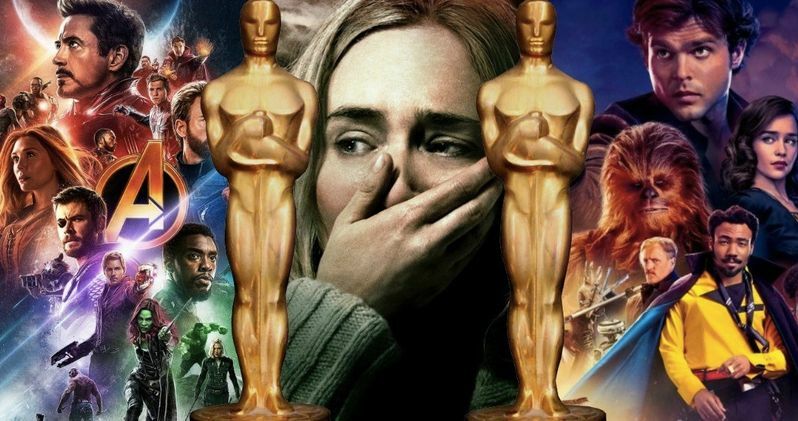 A Quiet Place will be competing against Black Panther, Bohemian Rhapsody, First Man and Roma, which leads the pack overall with 10 nominations, tied with The Favourite. Last year, the Academy announced that they planned to include a new category at this year's ceremony that would honor popular movies. The idea was short-lived, as it was wildly unpopular and faced a great deal of backlash. The thinking seemed to be that it might help improve ratings for the telecast. But these Oscars nominations help bring attention to movies that moviegoers all around the world paid a lot of attention to. Infinity War grossed more than $2 billion worldwide, making it one of the highest-grossing movies ever. Solo made just shy of $400 million which, by Star Wars standards, is disappointing, but still popular for sure. A Quiet Place also did very well for itself, earning $340 million worldwide. Especially considering it's relatively modest $17 million budget. But the Oscars also gave Black Panther seven nominations this year, including a landmark Best Picture nod. Director Ryan Coogler's $1.3 billion acclaimed box office smash becomes the first-ever superhero movie to land a Best Picture nomination. So, even without a popular movie category, quite a few popular movies scored some well-deserved recognition anyway. The 91st annual Academy Awards ceremony is set to take place on Sunday, February 24.